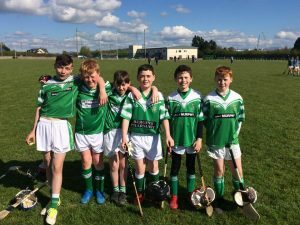 Moorefield U12 hurlers put on an exhibition of team hurling on Friday evening up in the club. A competitive game from Coill Dubh, Moorefield were led by Rory Cummins played with skill, teamwork and determination. Our next game is the shield final against Western Gaels on Saturday 16th. Hopefully they play better than posing for photographs. Well done to a skilful, spirited U12 hurling team that played against Cappagh in the club yesterday evening. These sporting young lads have a lot of activities on currently and everyone gave 100% on the field. Great skills of the game of hooking, blocking, hand-passing, free taking, finding player in space, shot stopping and taking chances of scores were on display from the first to the last minute. Thanks to Jimmy for refereeing the game. Next scheduled fixture is away to Celbridge next Friday. Details will be posted later. Moorefield U12’s played a great game of hurling in Coill Dubh yesterday evening. It was competitive from start to finish with every player playing their best. An old adage in GAA is; if you concede a score, you go back up the field and get a score and that is exactly was this panel of players did. There is an improvement in every game with every panel member playing his part. Next up is Broadford away next Friday evening. Moorefield GAA club played host to the first hurling Lily Óg session of 2018 this afternoon. U12 players from all over the county came together for this county training session. Well done to Adam, Alex, Niall, Shayne , Darragh and Eoin who represented the club very well. There will be tired happy boys sleeping well tonight and proud parents. A big thank you to ground staff have having the pitches and grounds in perfect condition.